Protozoa are non-phototrophic, unicellular, eukaryotic microorganisms with no cell walls. All protozoa are eukaryotes and therefore possess a “true,” or membrane-bound, nucleus. They also are nonfilamentous, in contrast to organisms such as molds, a group of fungi, which have filaments called hyphae and are confined to moist or aquatic habitats, being ubiquitous in such environments worldwide, from the South Pole to the North Pole. Many are symbionts of other organisms, and some species are parasites. The term Protozoa was introduced in 1818 for a taxonomic class, but in later classification schemes the group was elevated to higher ranks, including phylum, subkingdom and kingdom. In several classification systems proposed by Thomas Cavalier-Smith and his collaborators since 1981. The use of Protozoa as a formal taxon has been discouraged by some recent researchers, mainly because the term, which is formed from the Greek protos “first” + zoia, plural of zoion, “animal”, implies kinship with animals (metazoa) and promotes a separation of “animal-like” from “plant-like” organisms, neither of which they encourage. 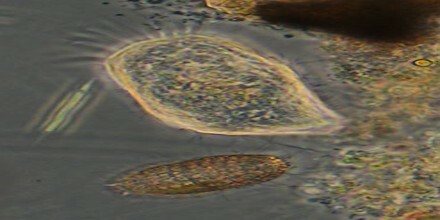 Modern ultrastructural, biochemical, and genetic techniques have shown that protozoa, as traditionally defined, belong to widely divergent lineages, and can no longer be regarded as “primitive animals”. Many protozoa cause diseases in animals and humans. Some, like Plasmodium, which causes malaria, can be devastating to people worldwide. Others, like Trichomonas, cause sexually transmitted diseases that are relatively benign and 100% curable. The vast majority of the species, though, are completely harmless. But, as is usually the case in microbiology, it’s the dangerous ones that get the most attention. 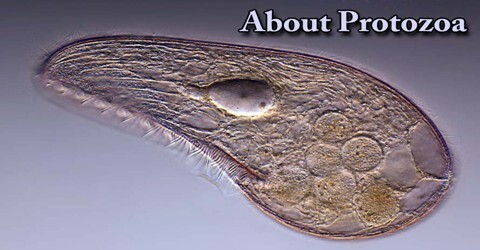 Most parasitic protozoa in humans are less than 50 μm in size. The smallest are 1 to 10 μm long, but Balantidium coli may measure 150 μm. 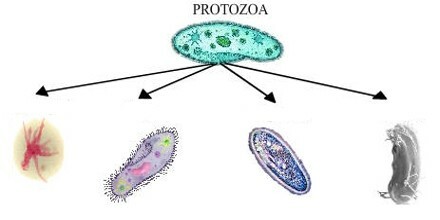 Protozoa are unicellular eukaryotes. As in all eukaryotes, the nucleus is enclosed in a membrane. In protozoa other than ciliates, the nucleus is vesicular, with scattered chromatin giving a diffuse appearance to the nucleus; all nuclei in the individual organism appear alike. The organelles of protozoa have functions similar to the organs of higher animals. The plasma membrane enclosing the cytoplasm also covers the projecting locomotory structures such as pseudopodia, cilia, and flagella. The outer surface layer of some protozoa, termed a pellicle, is sufficiently rigid to maintain a distinctive shape, as in the trypanosomes and Giardia. Some protozoa have a cytosome or cell “mouth” for ingesting fluids or solid particles. 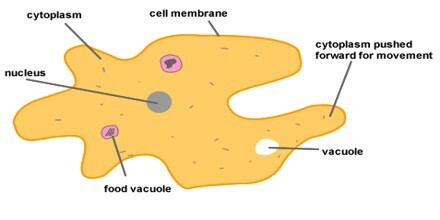 Contractile vacuoles for osmoregulation occur in some, such as Naegleria and Balantidium. Many protozoa have subpellicular microtubules; in the Apicomplexa, which have no external organelles for locomotion, these provide a means for slow movement. Many other structures occur in parasitic protozoa, including the Golgi apparatus, mitochondria, lysosomes, food vacuoles, conoids in the Apicomplexa, and other specialized structures. 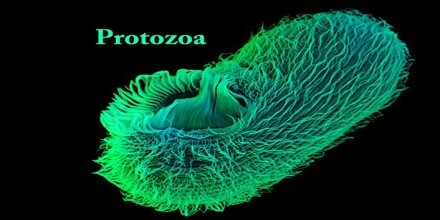 The classification of protozoa is mainly based on their means of locomotion. They are subdivided into the following four classes or subphyla by some taxonomists. Motility is due to the streaming of ectoplasm, producing protoplasmic projections called pseudopodia (false feet). Examples: Free-living form like Amoeba proteus* and parasitic form like Entamoeba histolytica. Locomotion is effected by one or more whip-like, thin structures called flagella. Examples: Free- living forms like Euglena viridis, Cercomonas longicauda, Heteronema acus and parasitic forms like Trichomonas vaginalis, Trypanosoma gambiense, Giardia lamblia. Locomotion is carried out by means of short hair-like projections called cilia, whose synchronous beating propels the organisms. Examples: Free-living forms like Paramecium caudatum, Stentor polymorpha, Vorticella campanula and parasitic form like Balantidium coli. Unlike the above three classless of protozoa, members of the class sporozoa do not have locomotor organelles in their mature stage; however, immature forms exhibit some type of movement. All the members of this group are parasites. Free-Living Protozoa: They ingest particulates, such as bacteria, yeast and algae. Parasitic Protozoa: They derive nutrients from the body fluids of their hosts.